Premium-quality Micrograin carbide tips are ground on specialized CNC equipment for an extra-fine finish with maximum sharpness and edge retention. 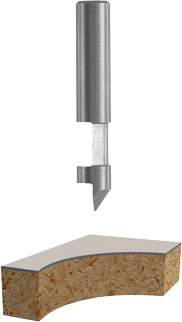 The hole and flush bit is used where laminate is applied over precut openings in the substrate. The bit bores through the laminate and cuts the laminate out of the opening. Solid carbide gives best rigidity and long life.